Ask! It is travel at its best. Find a local. And ask. Like your trip depends on it. I cannot tell you how much it enhances travel. Take everything you hear with a grain of salt. Don't believe everything you are told. Pre-trip planning is fine, and a good travel guide is absolutely necessary. But they are only good enough to get you to the general area. 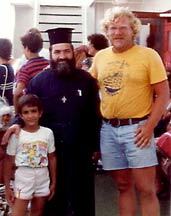 On a ferry boat to a Greek Island, I asked this Greek Orthodox priest for tips on Greek Cuisine and got a three hour dissertation. Wow! I tell you, this man knew his food! Come for a visit, so you can ask the your most important question... Find out the directions, the weather, and their viewpoints. Just get them to start talking. In a minute they will tell you what's great about their village. The smiles on their faces will tell you how proud they are about their amazing location. You know you will have the time of your life. A flash of interest and a mega-bomb of good fortune goes off. Ask the locals and stand back. It makes life fine. Show me a guy (a man) who doesn't want to ask for directions, and I will show you boredom personified. So get out of your skin, your routine, and your life. Find out the truth, true entertainment and your next really fine adventure. Simply, go up to somebody and start a conversation. There's no excuse. This is not a once in a lifetime offer. Ask a simple question of a local citizen, and have a better trip.